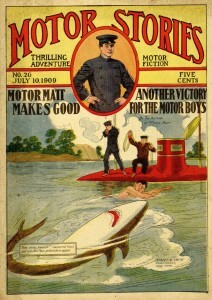 This week sees the release of the twentieth issue of Motor Stories on Project Gutenberg, courtesy of Distributed Proofreaders and our Digital Library. Motor Matt Makes Good; or, Another Victory for the Motor Boys concludes the “submarine Grampus” story arc begun all the way back in issue 12. The next issue could take Motor Matt and his friends just about anywhere! The issue also includes the conclusion to “The Spider Water,” begun last issue, and some filler material about alligators and venomous fish. The entire text may be read online or downloaded through Project Gutenberg.